“The Sri Lankan government (GSL) declared an eight-day period of mourning to coincide with observances in China. September 18, the day of Mao’s last rites in Peking, was also declared a day of national mourning and a public holiday.” the US Embassy Colombo informed Washington. “We would judge that a gradual trend in Sri lanka’s relation with China will develop which will lead to a less close relationship. This should have the effect of undermining, to some extent, the influence of the “Maoists” in the present government, with a corresponding reinforcement of moderate elements. To the extend this encourages more pragmatic economic policies and less attention to ideology, of which there is currently a surfeit, such a trend in the relationship between the two countries will be compatible with US interests. Unless there is a marked improvement in Sino-Soviet relations, however, we expect the Chinese and their local adherents will continue efforts to counter soviet influence in Sri Lanka and the area. We feel this will be useful in maintaining a balance of the external forces operating here which is also in our interest.” the Embassy said in a confidential cable. The Colombo Telegraph found the related leaked US diplomatic cable from the WikiLeaks database dated 1976 September 24. The cable is classified as “Confidential”. Reflecting the close and friendly relations between Sri Lanka and the People’s Republic of China (PRC), the Sri Lankan government (GSL) and media gave massive attention to Mao’s death and the following obsequies. Prime minister Bandaranaike was the main speaker at a September 20 condolence meeting. She stressed the closeness of relations between the two countries and between herself and Chou En-lai and Mao Tse-tung. Emphasis on the past points up the fact that the bases of China-Sri Lanka relations have been shifting. It seems probable that the new Chinese leadership may be less forthcoming in its assistance to Sri Lanka, and this, combined with other factors, should create a trend toward a less close relationship between these two countries. Such a trend may enhance the influence of moderates in the government, weaken the ideologues, and reinforce the trend toward more pragmatic economic policies. If so, this trend will be compatible with U.S. interests. Massive publicity was given to Mao Tse-tung’s death and the ensuing period of mourning, particularly by the government-controlled lake house newspapers. Coverage included articles and pictures on Mao’s life and work as well as comments and messages on his death from other world leaders. The Sri Lankan government (GSL) declared an eight-day period of mourning to coincide with observances in China. September 18, the day of Mao’s last rites in Peking, was also declared a day of national mourning and a public holiday. A condolence book was opened by the chinese embassy which was open for all to sign. Ambassador reed did so on september 11. Flags were flown at half-mast throughout the period oand this lingered on through Sunday, September 19 (although the Chinese embassy raised its flag that day), probably because no one was around to raise the Sri Lankan flags. Prime minister Bandaranaike was the main speaker at a condolence meeting sponsired by the Sri Lanka-China Friendship Society held on September 20 in the Bandaranaike Memorial International Conference Hall, built as a gift by the Chinese. 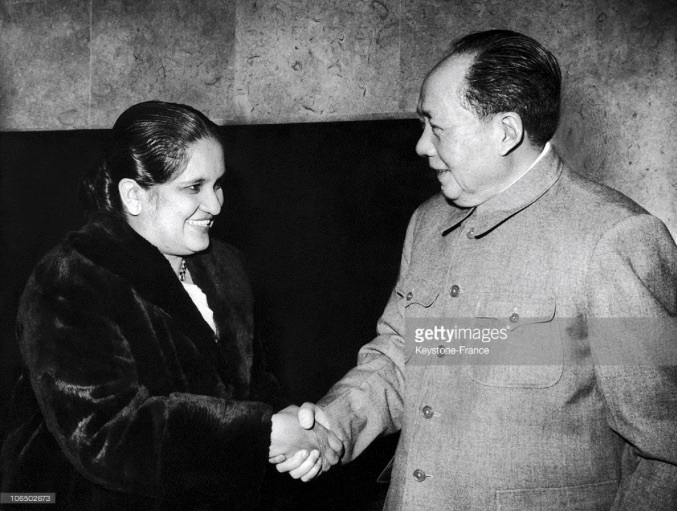 Speaking to a crowded hall, Mrs. Bandaranaike was lavish in her praise of Mao, Chou En-lai and the close and friendly relationship she and her governments, past and present, have had with china and the chinese leaders. The tone and extent of the Sri Lankan observances and publicity on Mao’s passing is indicative of the close ties which china has had over the years with Sri Lanka and particularly during Bandaranaike governments. These have been based on: generous Chinese aid with no visible strings; the annual Rubber-Rice barter agreements which stretch back to 1952 and gave China an assured source of Rubber during battle act times while providing favorable financial terms to Sri Lanka; a close personal relationship between Mrs. Bandaranaike and Chou En-lai; Sri Lanka’s constant support for china in its efforts to gain diplomatic recognition; and china’s desire to counter soviet and Indian influence in the area. Remarkable in all the speeches and tributes was the emphasis on times past. This may reflect a growing uneasiness on the part of the sri lankans, brought on by the death of Chow and the decline and death of Mao, that the closeness of their relationship with the Chinese is being undermined. The basis of the relationship has changed over time and may change further. At present, the benefits obtained seem to be heavily in Sri Lanka’s favor. The new rulers of China may be less willing to provide large amounts of assistance to what they may consider an inefficient and bourgeois government. The personal ties at the highest level have been broken and the diplomatic support offered to the prc in the past may become less important to the new chinese leadership. China is no longer dependent on Sri Lankan rubber. It can now obtain it from Malaysia. Yet, there are still strong links and common interests between the two countries. One day after the condolence meeting, Prime Minister Bandaranaike marked the commencement of the Chinese-financed Gin Ganga flood control and irrigation project for which the PRC is providing $13 million and some 200 construction technicians. The Rice-Rubber Agreements continue, although more on the basis of a source of rice for Sri Lanka rather than a source of rubber for china. A joint merchant shipping venture is going ahead. China probably still sees Sri Lanka as an area where the spread of Soviet and Indian influence can be checked. However, the Indian part of this equation has become less important, with the improvement Of Sri Lanka-India relations in the past few years and the more recent thaw, however limited, in Sino-Indian relations. Overall, we would judge that a gradual trend in Sri Lanka’s relation with China will develop which will lead to a less close relationship. This should have the effect of undermining, to some extent, the influence of the “Maoists” in the present government, with a corresponding reinforcement of moderate elements. To the extend this encourages more pragmatic economic policies and less attention to ideology, of which there is currently a surfeit, such a trend in the relationship between the two countries will be compatible with US interests. Unless there is a marked improvement in Sino-Soviet relations, however, we expect the Chinese and their local adherents will continue efforts to counter soviet influence in Sri Lanka and the area. We feel this will be useful in maintaining a balance of the external forces operating here which is also in our interest.